The auto industry has changed dramatically since 1908 when the Ford Model T was introduced. While the Model T was revolutionary (at the time) it was the creation of the assembly line that led to the boom of the automobile industry in the 1920s. Equipped for driving, parking and light controls and fueled by gas or diesel, this modern invention quickly became more affordable and accessible. Since then, technological advancements have become more complex with navigation systems, emergency warning systems, in-car entertainment and even hybrid vehicles. Vehicle telematics and connected cars have changed the face of the auto industry by providing features that help us not only drive safer, but keep us entertained as well. What the future holds for the automobile industry is only limited by your imagination. What was once thought of as "futuristic" concepts are quickly becoming reality. Many car manufacturers are racing to create the first fully autonomous vehicle on the road — and most say this will be achieved within five years. Moreover, the Institute of Electrical and Electronics Engineers (IEEE) predicts that in 2040, 75% of vehicles will be autonomous. CX, or Customer Experience, has become a competitive differentiator for many businesses. Not only is importance placed on the speed of responding to customer issues, but also the way in which these issues are resolved. How companies engage with their customers has evolved from providing solutions to customer complaints, to proactively anticipating problems and addressing them beforehand. Big Data, Data Science and Artificial Intelligence all play a part in Customer Experience. Big Data, which is used to understand patterns and trends, can improve customer experience by shaping experiences to drive repeat business, customer loyalty and profits. Related to Big Data, Data Science, or Data-Driven Science, is the method by which information is extracted from data. Businesses that incorporate these big data principles can be better informed about customers and can help understand customers mainly through the use of statistics. According to the article in MaritzCX, Big-Data - The Case for Customer Experience, 64% of organizations see CX as the primary ROI goal for Big Data. According to Gartner, by 2020 85% of business relationships will not be managed by humans. AI platforms can aid businesses' Customer Experience by analyzing buying patterns and recognizing individual customers. This helps to improve relevancy and deliver a better customer experience. This more personalized experience improves customer satisfaction and increases customer loyalty. Predictive Service allows businesses to detect and analyze data patterns in order to forecast future behavior based on past behavior. This is essential to businesses as it enables them to predict consumer behavior. Predictive services can recommend products to consumers from data. By helping customers easily find what they're looking for and tailoring experiences to consumer's needs based on data, customer experience can be greatly improved. The Car as a Consumer Service Platform has changed the face of the automobile industry. Today, car manufacturers have to consider the fact that consumers want a seamless customer experience. Cars have to do more than get a driver from point A to point B. Consumers are more connected than ever and want cars that provide them with the technologies and services they need. Vehicles have evolved from being able to plug in an mp3 player to play music to being connected with Internet access and features that alert the driver of arrival and departure times. 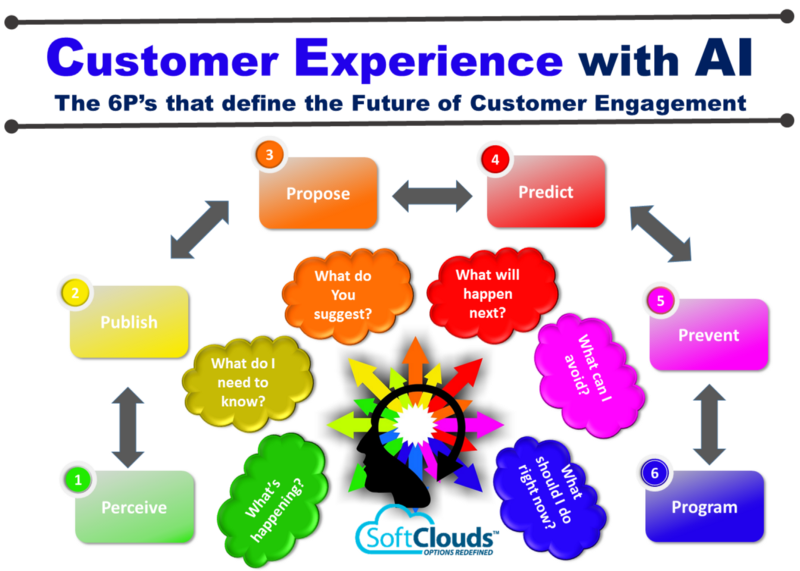 CRM must evolve to be meet the needs of the customer in the near future. 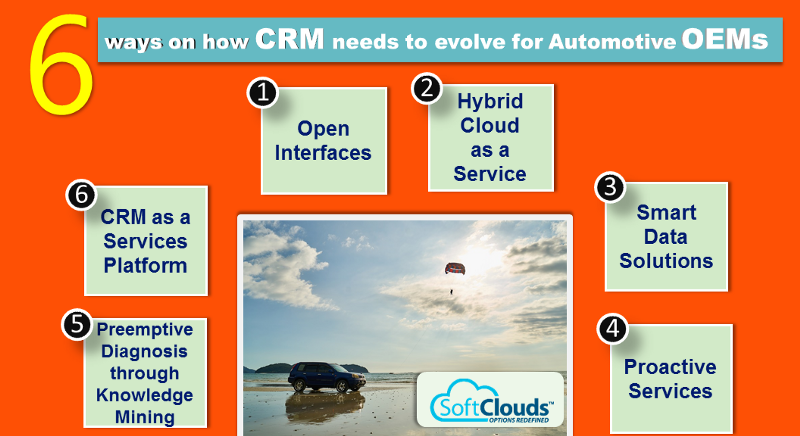 The current Customer Relationship Management (CRM) platforms help Auto OEMs deliver customer experiences for all customer-facing operations. Although it is able to tailor its CRM solutions to each industry with prebuilt integrations and role-based customer intelligence as well as being available in different platforms including mobile and in store, it needs to evolve due to a number of pitfalls. There is a need for industry-standard interfaces to connect to multiple solutions and services. For example — REST based APIs are the key to successful collaboration by allowing systems to easily communicate with one another securely and privately. This open communication results in good decisions. Open interfaces help because they are light weight, deal only with messages and require less configuration., Easy to access, Interoperable, Stateless, Scalable and can be used across domains. Since these are web based services the systems are loosely coupled and hence easy to use. Single Sign On (SSO) and Authentication are important as well as it saves time by allowing users to sign in once instead of multiple times to gain access to applications for which they have permissions. They also prove as a protection against hacking, which is another important need of the hour. In addition to fewer logins, other benefits include reduced calls to customer service, ease of change for user restrictions and increased security. For a great user experience, integration between various business applications (backend, frontend systems), real time communication systems and collaboration tools are necessary. With customer support processes and workflows along with multichannel experiences becoming the norm, the systems need to focus on real-time capabilities to streamline operations, boost productivity, improve interactions and enhance customer experience. This will need the OEMs to integrate their digital experience platforms and systems across CRM, contact centers and communication systems to be deeply integrated to share data and context and insights in real time to provide a seamless customer experience. Real-time processing provides better response times based on up-to-the-minute data and does not rely upon someone to run a batch process at a later time — or sometimes never. Additionally, smaller, real-time queries mean faster response times. Allowing multiple systems to "talk" to each other, like weather systems communicating with traffic systems to connect with CRM, allows for a better, more informed, customer experience. For CRM in the auto industry, this translates to integrating systems that enable communication with each other in the case of dealers with multiple franchises, for example, to better manage customers. Moreover, mixing private and public cloud services, or Cloud to Cloud Connectivity, businesses become more flexible and have access to more options with how they use data. Likewise, CRM needs to evolve to include Always on Connectivity, or real-time connectivity, which allows for access to information any time and from anywhere on any device. Big Data is important, but smart crunching of the data is important to make it Smart Data. Smart Data is, small pieces of Big Data evaluated for decision making across multiple servers/solutions. Big Data is a trove of data that can be totally meaningless if it doesn't provide actionable insights for the business. For example, sales data which is over two years old may be irrelevant to predicting sales today. However, service data might help in providing faster support services to the consumers. Proactive Support Services is the Next Generation Customer Experience. It is important as customers become more connected and organizations keep up with the evolving needs of the customer. Proactive services can help reduce costs, increase productivity, generate more revenue and increase customer loyalty. Also, secure, quality monitoring allows for immediate customer feedback, early detection of problems, the ability to measure customer experience, and a clearer understanding of user activity. Data Mining and Artificial Intelligence recognizes patterns in large data. Well mined data can help extract knowledge that when placed in the context of a CRM system that is geared towards generating knowledge from multiple entry points becomes extremely valuable to the customer experience. For example, collection of symptoms remediated through actions of independent support technicians spread across a network may point at the diagnosis of an underlying problem that may only become visible after a large set of data is crunched in connection with the knowledge generated around it. Data should be processed and will become more effective while collating what is known into assumptions about what the issue is — aka knowledge. The knowledge generated can be plugged back into support to provide better troubleshooting guidance. As newer services and technology platforms like Android Auto & Apple Car are integrated into cars for navigation, streaming content, communications and innovative services through the vehicles dashboard — the CRM needs to evolve as a services platform. By doing so, the CRM platform can provide interfaces for core services like (1) Billing Services that control billing and invoicing; (2) Single Sign on (3) Subscription Management and (4) On Demand Solutions for seamless, real-time integration — etc. 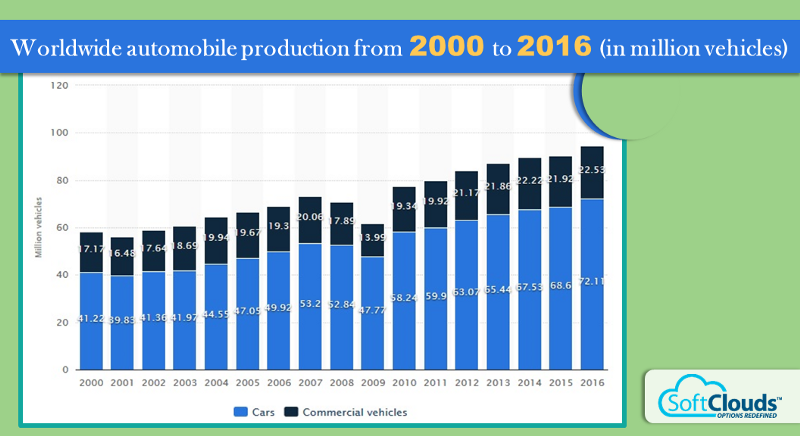 The Auto Industry is becoming increasingly global and competitive, and OEMs understand the need for CRM to satisfy customers and drive consumer decisions. A good customer experience begins when companies connect with customers even before a purchase is made — and it all starts with data. With the auto industry evolving at lightning speed, automotive OEMs need to get the most out of CRM to deal with customers' demand for excellent and real-time customer service. As OEMs deal with more informed users, they need to improve customer service to manage and build relationships with not only existing but potential customers as well. An improved futuristic CRM platform with the above six features will simplify the process of connecting with customers throughout the customer lifecycle. Staying focused on customers is an integral part of the automotive industry's ability to survive, especially because strong competition exists in the auto industry today. Effectively managing customers, improving the quality of products and services, and streamlining business operations can all be achieved through these six core pillars of CRM technology of the future. 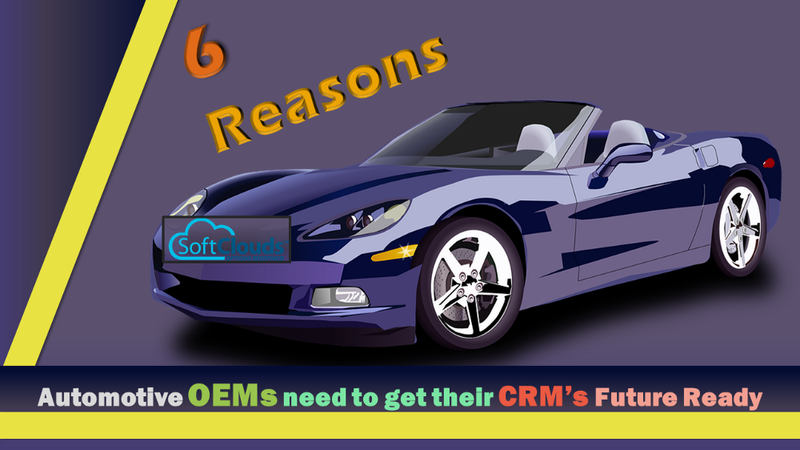 With the newer incumbent players in the Auto OEM Industry like Tesla and the likes, their CRMs are equipped with some of the six that we have mentioned above. That has helped them leap frog and become successful in the industry.